The Force is with me and I am one with the Force. Despite rewrites and reshoots, and an ensuing boycott, Disney’s standalone Stars Wars film Rogue One: A Star Wars Story had a stellar opening weekend. And it’s $290 million global debut was enough to propel Disney to a new Hollywood record. Walt Disney Studios will become the first movie studio to ever hit $7 billion (it grossed $6.99 billion globally through Dec. 18) at the global box office in a single year, the company announced yesterday. Disney’s extensive slate of superhero blockbusters including Marvel’s Captain America: Civil War and Doctor Strange as well as animated epics like Finding Dory and Zootopia released in 2016 drove the record-setting box-office totals. Theatrical releases from 2015 that remained in theaters this year, such as Star Wars: The Force Awakens, also gave Disney a healthy boost in 2016, the company said. Disney’s films topped the US box office as well, overtaking Universal Studios’ 2015 record of $2.45 billion. 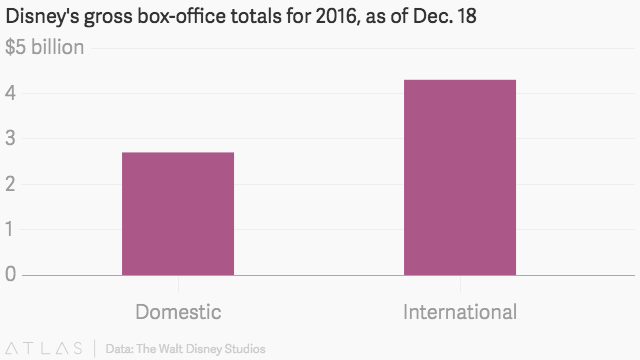 As of Dec. 18, Disney’s domestic box-office total was around $2.7 billion. Not all of Disney’s businesses fared as well as its films in 2016. Another core business—cable—has been faltering as more customers turn to unbundled pay-TV and streaming packages. Disney’s crown cable jewel, ESPN, for example, has been hemorrhaging subscribers and there’s speculation about a spinoff of the sports network. The changing TV landscape, which makes up 50% of Disney’s operating income, has placed more pressure on the media conglomerate’s other business units, including its film studios, theme parks, and consumer products. Those segments have been working in concert with one another to leverage Disney’s lucrative creative properties including Marvel and its comic-book universe, Pixar and its animated classics, and Lucasfilm and its Star Wars and Indiana Jones films.